Lord, I call upon Thee. Hear me. Hear me, O Lord. Lord, I call upon Thee. Hear me. Receive the voice of my prayer when I call unto Thee. Hear me, O Lord. 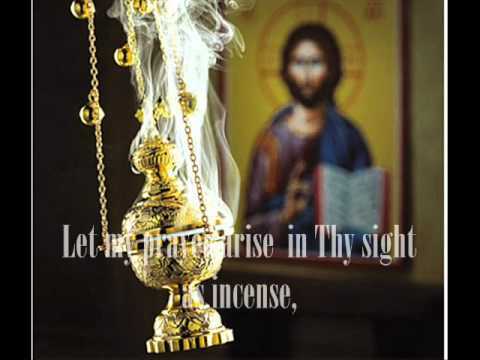 Let my prayer arise in Thy sight as incense, and let the lifting up of my hands be an evening sacrifice. Hear me. Hear me, O Lord. Blessed is the man who has not walked by the counsel of the ungodly. Alleluia (Thrice). For the Lord knows the way of the righteous, and the way of the ungodly shall perish. Alleluia (Thrice). Serve the...View moreBlessed is the man who has not walked by the counsel of the ungodly. Alleluia (Thrice). Serve the Lord with fear, and rejoice in Him with trembling. Alleluia (Thrice). Blessed are all who put their trust in Him. Alleluia (Thrice). Arise, O Lord: save me, O my God. Alleluia (Thrice). Alleluia, alleluia, alleluia. Glory to Thee, O God (Thrice). 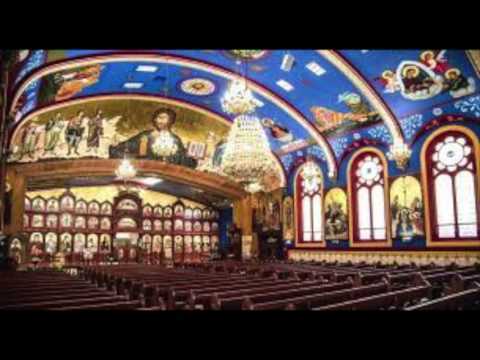 Please enjoy my rendition of "Blessed is the Man", a hymn sung in the Orthodox church. Lord, how those who trouble me have increased! Many are rising up against me. Many say to my soul: There is no salvation for him in his God. But thou, O Lord, art my Protector, my glory, and the lifter up of my head. I cried to the Lord with my voice, and He heard me from His holy mountain. I lay down and slept; I awoke, for the Lord sustains me. I will not be afraid of the myriads of people set in a circle against me. Arise, O Lord, save me, O my God. For Thou hast struck all who without cause are my enemies; Thou hast broken the teeth of the sinners. Salvation is of the Lord, and Thy blessing is upon Thy people. Thou art clothed with praise and splendour. On the mountains waters stand. How marvellous are Thy works, O Lord! The waters flow between the mountains. Thou hast made all things in wisdom. Glory to Thee, O Lord, Who hast made them all. Why Orthodox? Are not all believers worthy of prayer? In fact, in need of prayer? "The Synekdemos" is a prayer book of the Orthodox Church containing daily prayers, hymns, and liturgical services. Originally written in Greek, a portion of the 1300-page book has been translated into English. Let God arise, and let His enemies be scattered; and let those who hate Him flee from His presence. As smoke vanishes, let them vanish, and as wax melts from the presence of fire, so let the demons perish from the presence of those who love God and who sign themselves with the sign of the cross and say in gladness, "Hail, most precious and life-giving cross of the Lord, for thou drivest away the demons by the power of our Lord Jesus Christ crucified on thee, Who went down to Hell and trampled on the power of the devil, and gave us thee, His venerable cross, for driving away all enemies. O most precious and life-giving cross of the Lord, help me with our holy Lady, the Virgin Mother of God, and with all the saints throughout the ages. Amen." Into Thy hands, O Lord Jesus Christ, my God, I surrender my spirit and body; bless me, save me, and grant me eternal life. Amen. Before retiring (or if one prefers, before beginning prayers) go through all the points suggested below in your mind and memory. 1. Give thanks to Almighty God for granting you during the past day, by His grace, His gifts of life and health. 2. Examine your conscience by going through each hour of the day, beginning from the time you rose from your bed, and recall to memory: where you went, how you acted and reacted towards all persons and other creatures, and what you talked about. Recall and consider with all care your thoughts, words and deeds from morning till evening. 3. If you have done any good, do not ascribe it to yourself but to God Who gives us all the good things and thank Him. Pray that He may confirm you in this good and enable you to do other good things. 4. But if you have done anything evil, admit that this comes from yourself and your own weakness, from bad habits or weak will. Repent and pray to the Lover of men that He may forgive you, and promise Him firmly never to do this evil again. 5. Implore your Creator with tears to grant you a quiet, undisturbed, pure and sinless night, and to enable you on the coming day to devote yourself wholly to the glory of His holy Name. 6. If you find a soft pillow, leave it, and put a stone in its place for Christ's sake. If you sleep in winter, bear it, saying: Some did not sleep at all. O Lord, Lover of men, is this bed to be my coffin, or wilt Thou enlighten my wretched soul with another day? Here the coffin lies before me, and here death confronts me. I fear, O Lord, Thy judgment and the endless torments, yet I cease not to do evil. My Lord God, I continually anger Thee, and Thy immaculate mother, and all the heavenly powers, and my holy guardian angel. I know, O Lord, that I am unworthy of Thy love but deserve condemnation and every torment, but, whether I want it or not, save me, O Lord, for to save a good man is no great thing, and to have mercy on the pure is nothing wonderful, for they are worthy of Thy mercy. But show the wonder of Thy mercy on me, a sinner. In this, reveal Thy love for men, lest my wickedness prevail over Thy unutterable goodness and mercy, and order my life as Thou wilt. With the saints, give rest, O Christ, to the souls of Thy servants where there is no pain, no sorrow, no sighing, but life everlasting. Lighten my eyes, O Christ God, lest I sleep in death and lest my enemy say, "I have prevailed over him." Be my soul's defender, O God, for I step over many snares. Deliver me from them and save me, O Good One, in Thy love for men. Let us not silently hymn the most glorious Mother of God, holiest of holy angels, but confess her with heart and mouth to be the Mother of God, for she truly bore God incarnate for us and prays without ceasing for our souls. Amen. I confess to Thee, my Lord, God and Creator, to the One glorified and worshipped in Holy Trinity, to the Father, Son and Holy Spirit, all my sins which I have committed all the days of my life, at every hour, in the present and in the past, day and night, in thought, word and deed; by gluttony, drunkenness, secret eating, idle talking, despondency, indolence, contradiction, neglect, aggressiveness, self love, hoarding, stealing, lying, dishonesty, curiosity, jealousy, envy, anger, resentment, and remembering wrongs, hatred, mercenariness; and by all my senses: sight, hearing, smell, taste, touch; and all other sins, spiritual and bodily, through which I have angered Thee, my God and Creator, and caused injustice to my neighbours. Sorrowing for this, but determined to repent, I stand guilty before Thee, my God. Only help me, my Lord and God, I humbly pray Thee with tears. Forgive my past sins by Thy mercy, and absolve me from all I have confessed in Thy presence, for Thou art good and the Lover of men. Amen. O Lord, Lover of men, forgive those who hate and wrong us. Do good to those who do good. Grant our brothers and relatives their saving petitions and eternal life. Visit the sick, and grant them healing. Guide those at sea. Travel with travellers. Struggle alongside the Orthodox. To those who serve and are kind to us, grant remission of sins. On those who have charged us, unworthy as we are, to pray for them, have mercy according to Thy great mercy. Remember, O Lord, our fathers and brothers who have fallen asleep, and grant them rest where the light of Thy countenance shines. Remember, O Lord, those who bear fruit and do good works in Thy holy churches, and grant them their saving petitions and eternal life. Remember also, O Lord, us Thy humble, sinful and unworthy servants, and enlighten our minds with the light of knowledge of Thyself. Guide us in the way of Thy commandments, by the prayers of our immaculate Lady, Mother of God and Ever-Virgin Mary, and of all Thy saints, for Thou art blessed to the ages of ages. Amen. O God, absolve, remit, and pardon our voluntary and involuntary sins, in word and deed, known and unknown, by day and by night, in mind and thought; forgive us all, in Thy goodness and love for men. O angel of Christ, my holy guardian and protector of my soul and body, forgive me all my sins of today. Deliver me from all the wiles of the enemy that I may not anger my God by any sin. Pray for me, sinful and unworthy servant, that thou mayest present me worthy of the kindness and mercy of the All-holy Trinity and the mother of my Lord Jesus Christ and of all the saints. Amen. Queen of the heavenly host, defender of our souls, we thy servants offer to thee songs of victory and thanksgiving, for thou, O mother of God, hast delivered us from dangers, but as thou hast invincible power, free us from conflicts of all kinds that we may cry to thee, "Rejoice, unwedded bride!" Most glorious, ever-virgin, blessed mother of Christ our God, present our prayer to thy Son and our God, and pray that through thee He may save our souls. I put all my hope in thee, O mother of God. Guard me under thy protection. O virgin mother of God, despise not me, a sinner, needing thy help and protection, and have mercy on me, for my soul hopes in thee.